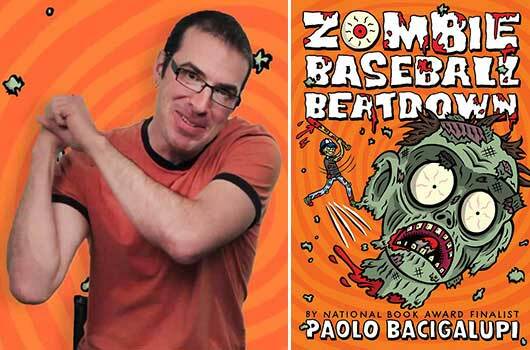 The boys who read this—and its readers will be mostly boys—will love the frenetic action and high gross-out factor: puke jokes, a lagoon of cow manure, and snapping decapitated zombie cow heads. In these swiftly moving pages the three heroes—Indian-American Rabi, Mexican-American Miguel, and “All-American” boy Joe, negotiate both ordinary travails (such as a bully and his gang of goons) and the major disaster the title refers to. Rabi, the narrator, is great with baseball statistics but not much good with a bat, reaping the continual scorn of bully Sammy, whose father runs the local meatpacking plant. When that packing plant emits a much more awful odor than normal one day, Rabi, Miguel and Joe find out why: in trying to dope the cows into weighing more, the plant has inadvertently created a zombie cow strain that spreads easily to humans. Underneath the nonstop comic action, Bacigalupi has serious concerns on his mind: the cruelty of our immigration policy and tactics that deprive Miguel of his parents, aunt and uncle; the chemical alteration of our food supply (Upton Sinclair would be proud); and the inhumanity of corporate greed. Despite its sensationalistic content and hyped-up narrative style, this is a novel that begs to be read by adults as well as children, and to be discussed at length. Simply superb.